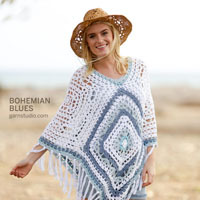 Go to original pattern for design DROPS Extra 0-1191. 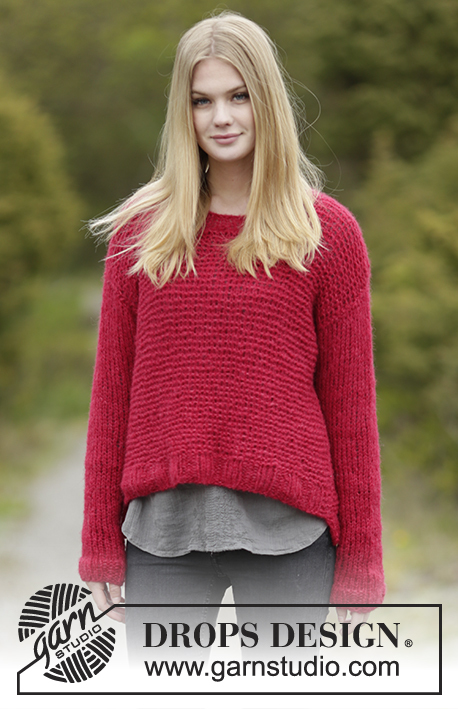 Knitted DROPS jumper in garter st and stocking st in "Melody". Size S-XXXL. 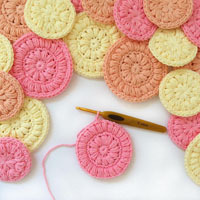 DROPS CIRCULAR NEEDLE (60 or 80 cm) SIZE 8 mm - or size needed to get 11 sts x 23 rows in garter st = 10 x 10 cm. 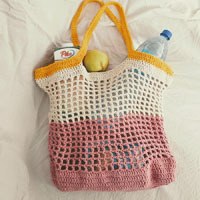 You can get the yarn to make this pattern from	14.00£. Read more. Inc 1 st by making 1 YO inside 1 edge st, on next round work YO twisted (i.e. work in back loop of st instead front) to avoid holes. Dec 1 st in each side of piece by K 2 tog inside 1 edge st in each side of piece. Cast on 59-65-71-83-89-95 sts (incl 1 edge st in each side) on circular needle size 8 mm with Melody. Work rib as follows: 4 sts in GARTER ST - see explanation above, rib * K 3, P 3 *, repeat from *-* until 7 sts remain, K 3, 4 sts in garter st. When piece measures 5 cm, insert 1 marker in each side - used for assembly. Then work in garter st while AT THE SAME TIME on 1st row dec 1-1-1-5-5-5 sts evenly = 58-64-70-78-84-90 sts. 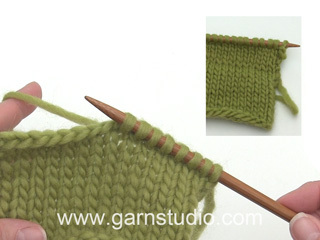 REMEMBER THE KNITTING TENSION When piece measures 24 cm, dec 1 st in each side of piece - READ DECREASE TIP! Repeat dec every 0-0-6-5-5-6 cm 0-0-1-2-2-2 more times = 56-62-66-72-78-84 sts. When piece measures 37-38-39-40-41-42 cm, cast off 3 sts in each side for armhole = 50-56-60-66-72-78 sts. When piece measures 51-53-55-57-59-61 cm, cast off the middle 16-16-16-18-18-18 sts for neck and finish each shoulder separately. Continue to cast off 1 st on next row from neck = 16-19-21-23-26-29 sts. Cast off when piece measures 53-55-57-59-61-63 cm. Work the other shoulder the same way. Cast on 53-59-59-65-71-77 sts (incl 1 edge st in each side) on circular needle size 8 mm with Melody. Work rib as follows: 4 sts in garter st, rib * K 3, P 3 *, repeat from *-* until 7 sts remain, K 3, 4 sts in garter st. When piece measures 5 cm, work in garter st while AT THE SAME TIME on 1st row inc 1-1-3-1-1-1 sts evenly - READ INCREASE TIP = 54-60-62-66-72-78 sts. 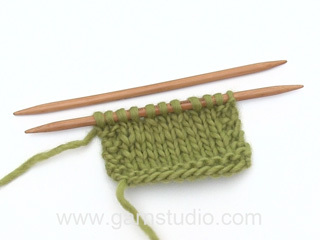 REMEMBER THE KNITTING TENSION When piece measures 19 cm, inc 1 st in each side of piece - READ INCREASE TIP! Repeat inc every 0-0-6-5-5-6 cm 0-0-1-2-2-2 more times = 56-62-66-72-78-84 sts. When piece measures 32-33-34-35-36-37 cm, cast off 3 sts in each side for armhole = 50-56-60-66-72-78 sts. When piece measures 37-39-41-42-44-46 cm, cast off the middle 12 sts for neck and finish each shoulder separately. Continue to cast off for neck on every row from neck as follows: Cast off 2 sts 1 time and 1 st 1-1-1-2-2-2 times = 16-19-21-23-26-29 sts remain for shoulder. Cast off when piece measures 48-50-52-54-56-58 cm. Work the other shoulder the same way. 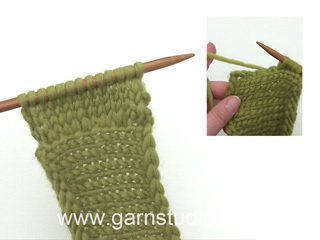 Cast on 26-26-26-32-32-32 sts (incl 1 edge st in each side) on circular needle size 8 mm with Melody. Work rib K 3/P 3 with 1 edge st in garter st in each side. When rib measures 4 cm, work in stocking st with 1 edge st in garter st in each side while AT THE SAME TIME adjusting no of sts on 1st row to 25-26-28-28-30-30. When piece measures 7 cm, inc 1 st in each side of piece. Repeat inc every 8-6½-6½-5½-5-4 cm 5-6-6-7-7-8 more times = 37-40-42-44-46-48 sts. 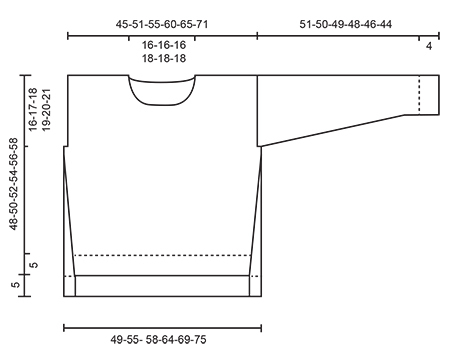 Cast off when piece measures 51-50-49-48-46-44 cm (shorter measurements in the larger sizes because of longer sleeve cap and wider shoulders). 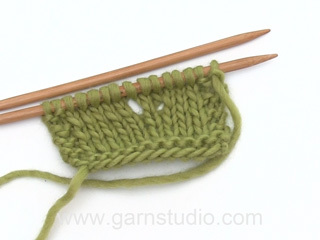 Knit another sleeve the same way. Pick up from RS approx. 50-56 sts around the neck on circular needle size 8 mm with Melody. Work rib = K 3/P 3 with 1 edge st in garter st in each side while AT THE SAME TIME adjusting no of sts on 1st row to 50-50-50-56-56-56. Cast off with K over K and P over P when rib measures approx. 2 cm. Sew left shoulder seam and neck edge. Sew in sleeves. Sew underarm and side seams inside 1 edge st - front piece is 5 cm shorter than back piece (sew down to marker on back piece).